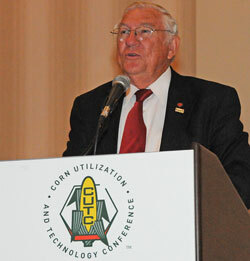 I previewed the keynote address to open the Corn Utilization and Technology Conference earlier today. Now here’s the full comments from Dr. Gale Buchanan, former USDA Chief Scientist and Under Secretary for Research, Education and Economics. Dr. Buchanan was introduced by NCGA President, Darrin Ihnen, and I’m also posting his welcome message. During the next couple days I’ll be doing a lot of interviews which will be used on Corn Commentary in coming weeks. I’ll also have more for you here so keep your eyes and ears open. Dr. Buchanan devoted the theme of his speech to the need for a “new green revolution” and pointed to the work of Dr. Normal Borlaug and many of the things he said about the importance of good scientific agricultural research. He says all branches of science will be needed to create the new green revolution to feed the world in the future. Some of the concerns he has include the availability of fertilizer resources and global climate change. One of my favorite remarks he made was, “At the time you need the results of research, it’s too late.” He used the problem BP is having with the Gulf oil spill as an example, saying they waited too long to do research on what to do if such a problem occurred.